The E+E Elektronik EE850 duct mount sensor merges the CO2, relative humidity and temperature measurement in a single device. The sensor can be simply integrated into a bus system via the RS485 interface (Modbus RTU or BACnet MS/TP). The 3-in-1 device is designed for building automation as well as for exacting process control. The device highlights the company’s dual wavelength NDIR CO2 sensing cell, which is especially insensitive to contamination. The CO2 auto-calibration and temperature compensation lead to high accuracy and long-term stability over the complete working range of 0…10,000 ppm CO2 and -20C to +60C (-4F-140F). The RH and T sensing element located inside the probe is optimally protected from dust, dirt and corrosion by the proprietary E+E coating. The coating improves the measurement performance and long-term stability in a harsh environment by preventing stray impedances caused by deposits on the active sensor surface. 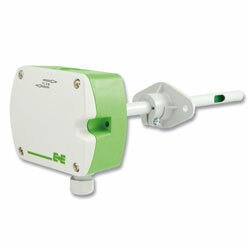 Configuration and adjustment can be accomplished with an optional adapter and the free EE-PCS configuration software. The functional enclosure aids mounting the EE850 with closed cover. This protects the electronics from construction site pollution through installation. A mounting flange is incorporated in the scope of supply.